Traffic on the Dutch roads has a lot of problems with the railroad actions on Monday morning. At 7.30 am there was more than 500 kilometers of traffic jam, much more than usual on a Monday morning. The ANWB notes that many people have decided to take the car to work because the trains did not run until 7.06 a.m. The Dutch Railways hoped to get the timetable back on track quickly, but this seems to take more effort than expected. Trains run, but not entirely according to the timetable. On the road, the ANWB expects much trouble in the coming hours from the slow actions of police, customs and defense employees. They drive across the full width of the road from 7.00 a.m. to The Hague at a speed of 66 kilometers per hour. This is done from various points in the country. Moreover, it is raining and that has led to accidents in various places. On the A9 from Alkmaar to Amstelveen and the A28 from Harderwijk to Amersfoort, motorists must take into account an extra hour of travel time. Throughout the country, union members are demonstrating Monday before freezing the retirement age at 66. This can have consequences for train and car traffic. 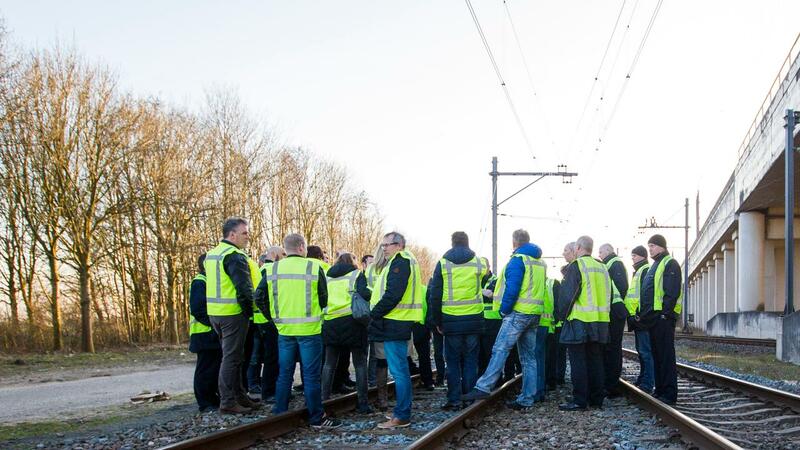 Employees of the Dutch Railways and regional transporters put down the work between 6.00 and 7.06. Even after they have returned to work, the timetables are experiencing the consequences of that strike. There are manifestations of the unions in nine major cities. In The Hague, the unions of the emergency services hold a protest march through the city. Campaigners from various professional groups are also meeting in Amsterdam, Rotterdam, Utrecht and Arnhem, among others. At Schiphol, security, passenger and baggage handling employees leave their work for 66 minutes from 12.30 onwards. The campaigns started in the night from Sunday to Monday with a strike by port workers from Rotterdam, Amsterdam and Zeeland and by the cleaners at Schiphol. Uber drivers will also leave work on Monday. They will take action at their employer's Amsterdam headquarters. They demand that the tech company cease with constant and unhealthy high pressure. According to the campaigners, the patience is gone. "We are being milked by constantly rising costs and a decreasing number of Uber journeys," can be read on the website uberstaking.nl. The Uber drivers say they regularly have to drive more than 60 hours a week for a moderate wage. This causes fatigue, which is at the expense of concentration and therefore safety. Uber drivers want the commission on taxi rides lowered to 15 percent, instead of the 25 percent now. They also ask for a sales guarantee for the three different Uber services. In addition, Uber is no longer allowed to take a unilateral decision to permanently put a driver aside. The drivers gather at the NDSM square, from where they will drive to Uber's head office. The strike coincides with the national action day on pensions.